Solena at the Vineyards will be located just off the scenic Catawba River. Plans for Meritage Homes’ newest community in Charlotte, North Carolina are quickly standing out among the top 55+ communities in the Queen City and surrounding areas. Solena at The Vineyards will offer residents upscale amenities, a variety of elegant home designs, and a convenient location. The community is slated to have a total of 200 single-family homes once it’s fully completed. While all homes in Solena are one story, potential homebuyers can choose between five different floor plans that vary in look and feel. Homes can have up to three bedrooms, two full bathrooms, and attached two-car garages. Basic home features include water-efficient fixtures and tray ceilings in the master bedrooms, as well as kitchens with island bars. Upgrades like fireplaces can be added to each plan to suit any homeowner’s wants and needs. Prices start in the high $200s and go up to the mid $300s while square footage ranges from 1,591 to 2,099 square feet. Homeowners’ association fees cover home lawn service and maintenance in The Vineyard’s common areas, so residents can enjoy a low-maintenance lifestyle without a ton of added headaches from small problems and issues that may arise. Part of The Vineyards master-planned community, homeowners in Solena will have access to the already build amenities. That includes a 7,000 square-foot clubhouse known as the Moterra Manor House, a hub of activity with a business center, multi-purpose room, and a state-of-the-art fitness center featuring a wide variety of cardiovascular and weight training machines. Outdoor amenities include resort-style swimming and lap pools, a sports complex that features several athletic courts, including tennis, bocce ball, pickleball, and sand volleyball courts. 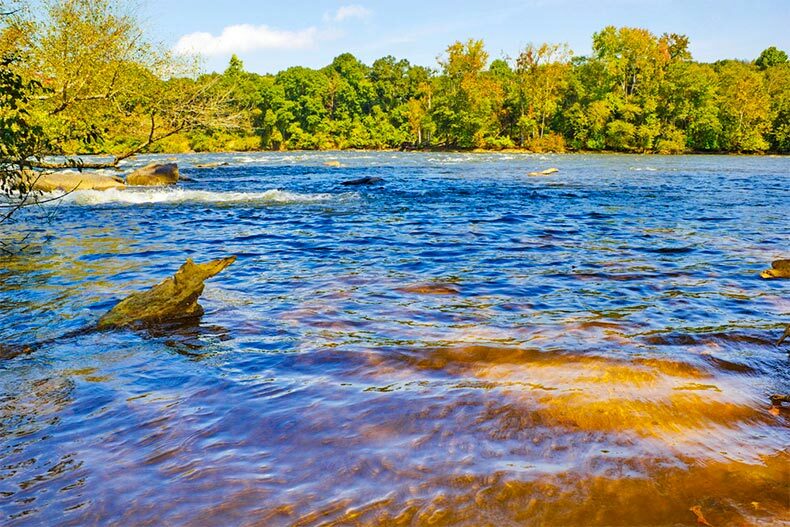 Additionally, there’s a dog park perfect for a leisurely stroll with your favorite four-legged friend, 10 miles of well-marked walking trails for residents who want to get outdoors and stay active, and a boat ramp that drops directly into the Catawba River. As far as social events go, the community has a full calendar of happenings and holiday parties scheduled throughout the entire year for its residents to enjoy with neighbors. Along with the community’s many amenities, its location is another big draw for residents who want to be close to everything but also want a little peace and quiet. The Vineyards has the best of both worlds with the small town of Belmont and its charm and slower pace nearby, plus the city of Charlotte and everything it has to offer right down the road. Belmont boasts several quaint local restaurants and cafes, antique stores, the Daniel Stowe Botanical Garden, and the U.S. National Whitewater Center within a few miles. The community is also less than 10 minutes from Uptown Charlotte and the upscale restaurants, renowned theaters, shopping centers, trendy salons, spas, and professional sports complexes it hosts. Beyond Belmont and Charlotte, The Vineyard is conveniently located near two major highways, Interstates 85 and 485, Charlotte Douglas International Airport, several top-rated hospitals, and more.